...and yet again on this Latin American homecoming tour, another powerful message from the Pope to reiterate one of his core priorities. 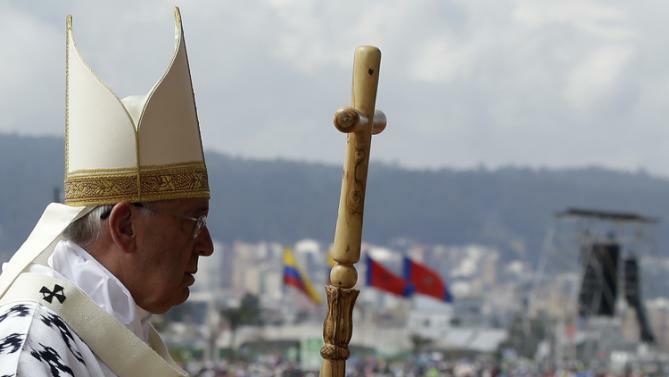 In the second homily of a papal trek whose messages are quickly shaping up as a crash course in "Francis 101," yesterday's Synod salvo in Guayaquil was followed up this morning by an emphasis on a missionary church in the Ecuadorean capital, Quito. And with it, amid the ongoing "fantasies of [his] many supposed 'defenders' who've sought to portray Francis less as Simon Peter than Simón Bolívar" – the 19th century leader of Latin America's liberation from colonial rule – the man himself aimed right at the difference between the two, then reaching beyond to the very "cry" of Jesus. As context goes, today's focus – couched in a votive Mass for the Evangelization of Peoples (fullvid) – springs directly from the twin foundational texts of Jorge Bergoglio's ecclesiology: Evangelii gaudium, Francis' sweeping governing manifesto whose "dream" of a church driven to live "a missionary option" provides the sole roadmap through which this pontificate can genuinely be understood, and its predecessor, the 2007 Aparecida Charter of the Latin American bishops (its drafting led by the then cardinal-archbishop of Buenos Aires), which presented a vision of a church engaged in "permanent mission" and, with it, the foreshadowing of what the newly-elected Pope would famously term "a church which is poor and for the poor!" Here, an additional note: for someone who recently admitted to not having watched television in nearly 25 years and previously said he couldn't operate a device that "has more than two buttons on it" – in the cited instance, a CD player (when his cherished opera recordings stopped being pressed on vinyl) – Francis' sense of effective settings and optics in a multimedia age is uncannily well-targeted. In that light, with today's second reading in the indigenous language of Quechua and the Pope clad in a striking black-on-white patterned chasuble of native origin, the pontiff served to viscerally underscore what's arguably the most consequential ad intra push in Evangelii gaudium (a point most Anglophone "experts" completely missed): namely, its cited "imperative... to inculturate the Gospel" – a work through which, once achieved, "the diversity of peoples who experience the gift of God, each in accordance with its own culture... expresses [the church's] genuine catholicity and shows forth the 'beauty of her varied face.'" 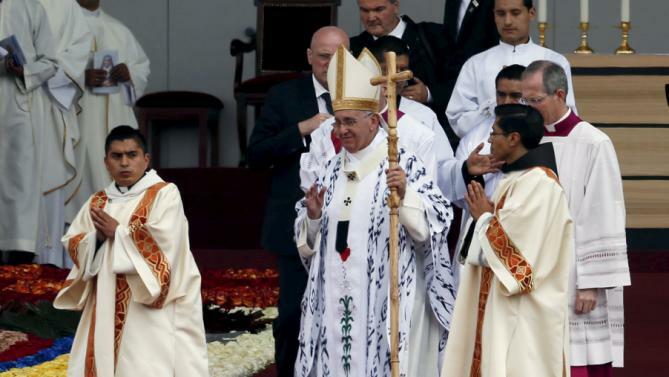 After decades of wrangling between Rome and the bishops of Asia and Africa over the latter's incorporation of evocative local understandings into their churches' witness, like too much else that watershed call remains largely ignored... and as his first US trek draws ever nearer, seemingly no less than Francis himself grasps that simply being heard – let alone heeded – might just take a miracle all its own. The word of God calls us to live in unity, that the world may believe. I think of those hushed words of Jesus during the Last Supper as more of a shout, a cry rising up from this Mass which we are celebrating in Bicentennial Park. The bicentennial which this Park commemorates was that of Latin America’s cry for independence. It was a cry which arose from being conscious of a lack of freedom, of exploitation and despoliation, of being “subject to the passing whims of the powers that be” (Evangelii Gaudium, 213). I would like to see these two cries joined together, under the beautiful challenge of evangelization. We evangelize not with grand words, or complicated concepts, but with “the joy of the Gospel”, which “fills the hearts and lives of all who encounter Jesus. For those who ac­cept his offer of salvation are set free from sin, sorrow, inner emptiness and loneliness” (ibid., 1). We who are gathered here at table with Jesus are ourselves a cry, a shout born of the conviction that his presence leads us to unity, “pointing to a horizon of beauty and inviting others to a delicious banquet” (ibid., 15). “Father, may they be one... so that the world may believe”. This was Jesus’ prayer as he raised his eyes to heaven. This petition arose in a context of mission: “As you sent me into the world, so I have sent them into the world”. At that moment, the Lord was experiencing in his own flesh the worst of this world, a world he nonetheless loved dearly. Knowing full well its intrigues, its falsity and its betrayals, he did not turn away, he did not complain. We too encounter daily a world torn apart by wars and violence. It would be facile to think that division and hatred only concern struggles between countries or groups in society. Rather, they are a manifestation of that “widespread individualism” which divides us and sets us against one another (cf. Evangelii Gaudium, 99), that legacy of sin lurking in the heart of human beings, which causes so much suffering in society and all of creation. But is it precisely this troubled world into which Jesus sends us. We must not respond with nonchalance, or complain we do not have the resources to do the job, or that the problems are too big. Instead, we must respond by taking up the cry of Jesus and accepting the grace and challenge of being builders of unity. There was no shortage of conviction or strength in that cry for freedom which arose a little more than two hundred years ago. But history tells us that it only made headway once personal differences were set aside, together with the desire for power and the inability to appreciate other movements of liberation which were different yet not thereby opposed. Evangelization can be a way to unite our hopes, concerns, ideals and even utopian visions. We believe this and we make it our cry. I have already said that, “in our world, especially in some countries, different forms of war and conflict are re-emerging, yet we Christians remain steadfast in our intention to respect others, to heal wounds, to build bridges, to strengthen relationships and to ‘bear one an­other’s burdens’ (Evangelii Gaudium, 67). The desire for unity involves the delightful and comforting joy of evangelizing, the conviction that we have an immense treasure to share, one which grows stronger from being shared, and becomes ever more sensitive to the needs of others (cf. ibid., 9). Hence the need to work for inclusivity at every level, to avoid forms of selfishness, to build communication and dialogue, to encourage collaboration. We need to give our hearts to our companions along the way, without suspicion or distrust. “Trusting others is an art, and peace is an art” (ibid., 244). Our unity can hardly shine forth if spiritual worldliness makes us feud among ourselves in a futile quest for power, prestige, pleasure or economic security. Such unity is already an act of mission, “that the world may believe”. Evangelization does not consist in proselytizing, but in attracting by our witness those who are far off, in humbly drawing near to those who feel distant from God and the Church, those who are fearful or indifferent, and saying to them: “The Lord, with great respect and love, is also calling you to be a part of his people” (Evangelii Gaudium, 113). The Church’s mission as sacrament of salvation also has to do with her identity as a pilgrim people called to embrace all the nations of the earth. The more intense the communion between us, the more effective our mission becomes (cf. John Paul II, Pastores Gregis, 22). Becoming a missionary Church requires constantly fostering communion, since mission does not have to do with outreach alone… We also need to be missionaries within the Church, showing that she is “a mother who reaches out, a welcoming home, a constant school of missionary communion” (Aparecida Document, 370). Jesus’ prayer can be realized because he has consecrated us. “For their sake I consecrate myself, that they also may be consecrated in truth”. The spiritual life of an evangelizer is born of this profound truth, which should not be confused with a few comforting religious exercises. Jesus consecrates us so that we can encounter him personally. And this encounter leads us in turn to encounter others, to become involved with our world and to develop a passion for evangelization (cf. Evangelii Gaudium, 78). Intimacy with God, in itself incomprehensible, is revealed by images which speak to us of communion, communication, self-giving and love. For that reason, the unity to which Jesus calls us is not uniformity, but rather a “multifaceted and inviting harmony” (Evangelii Gaudium, 117). The wealth of our differences, our diversity which becomes unity whenever we commemorate Holy Thursday, makes us wary of all totalitarian, ideological or sectarian schemes. Nor is this unity something we can fashion as we will, setting conditions, choosing who can belong and who cannot. Jesus prays that we will all become part of a great family in which God is our Father and all of us are brothers and sisters. This is not about having the same tastes, the same concerns, the same gifts. We are brothers and sisters because God created us out of love and destined us, purely of his own initiative, to be his sons and daughters (cf. Eph 1:5). We are brothers and sisters because “God has sent the Spirit of his Son into our hearts, crying “Abba! Father!” (Gal 4:6). We are brothers and sisters because, justified by the blood of Christ Jesus (cf. Rom 5:9), we have passed from death to life and been made “coheirs” of the promise (cf. Gal 3:26-29; Rom 8:17). That is the salvation which God makes possible for us, and which the Church proclaims with joy: to be part of the divine “we”. Our cry, in this place linked to the original cry for freedom in this country, echoes that of Saint Paul: “Woe to me if I do not preach the Gospel!” (1 Cor 9:16). It is a cry every bit as urgent and pressing as was the cry for independence. It is similarly thrilling in its ardor. May each of you be a witness to a fraternal communion which shines forth in our world! How beautiful it would be if all could admire how much we care for one another, how we encourage and help each other. Giving of ourselves establishes an interpersonal relationship; we do not give “things” but our very selves. In any act of giving, we give ourselves. “Giving of oneself” means letting all the power of that love which is God’s Holy Spirit take root in our lives, opening our hearts to his creative power. When we give of ourselves, we discover our true identity as children of God in the image of the Father and, like him, givers of life; we discover that we are brothers and sisters of Jesus, to whom we bear witness. This is what it means to evangelize; this is the new revolution – for our faith is always revolutionary – this is our deepest and most enduring cry.